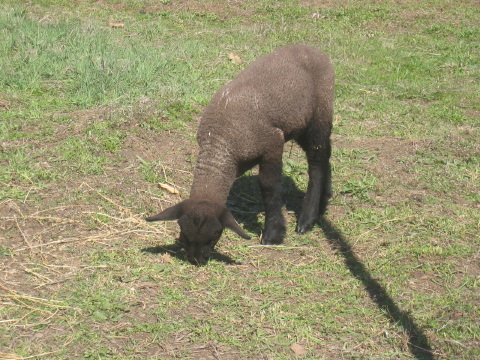 I housesat for a friend who has two lambs, three cats, and about a hundred orchids and many other delicate plants in a greenhouse. In addition to feeding and herding the animals in and out of various barns, the greenhouse needed attention. We've been having an early warming spring, so the greenhouse needed to be ventilated at day and closed up tight at night, with a humidifier running. This wasn't needless - in the mornings, I found a good inch of ice in the water bucket for the lambs that was left outdoors! Water in a cup in my car also froze solid overnight. 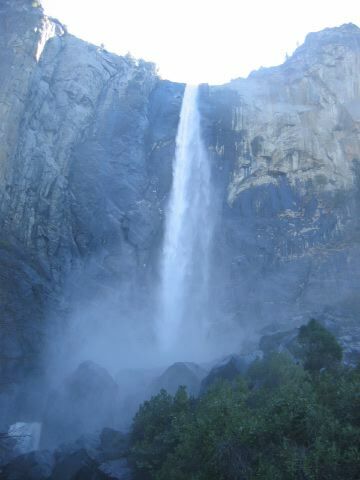 During the day, 70 degrees. Baa, baa, black sheep ... nope, no wool on these two! 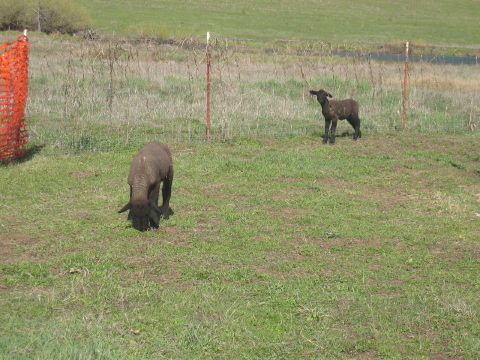 What they mostly do is graze. They are fed nice green tasty alfafa and nice bright yellow crunchy oats, but when they're done with that, they turn to the grass. 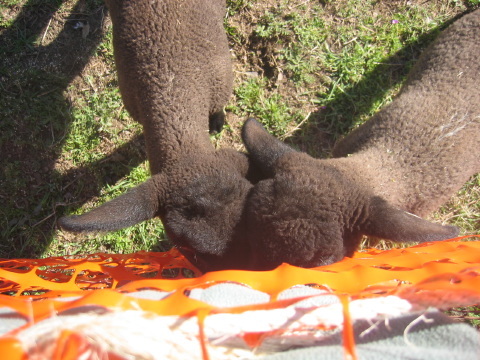 The lambs are incredibly friendly and love to be petted. 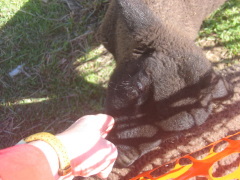 They also love to nibble on your hands - they don't bite, their nubby teeth just carefully close down on your hand. The two lambs both rush to the fence if you make any move of petting them. 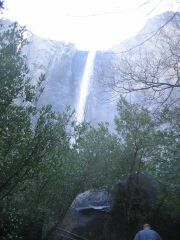 Bridelveil Falls in Yosemite, overexposed and overflowing. Another failed attempt to capture Bridelveil Falls. The most astonishing thing about the falls in early spring is the sound - like volleys of rifles punctuating a loud roar. 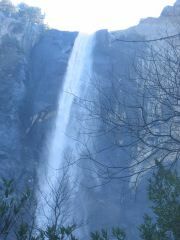 Apparently I was shooting into the sun, as well as into the mist. At this point all of us on the path were being drenched by the mist. There is something spellbinding about this particular falls, framed in the U-shape of the cliff. 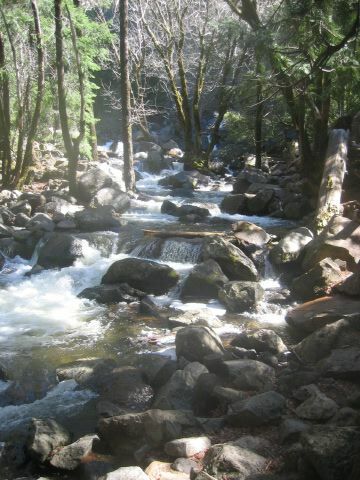 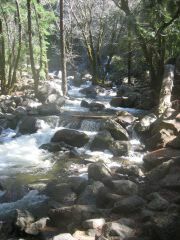 The particular beauty of Yosemite: the river rushing over rocks in the sun. 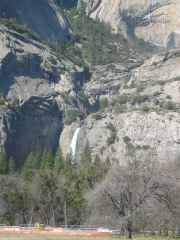 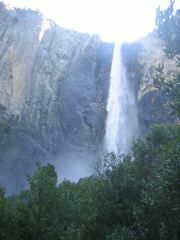 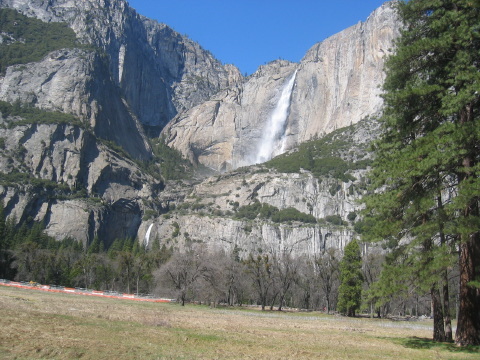 Now I will be corrected by people who know better, but, this is likely Yosemite Falls. 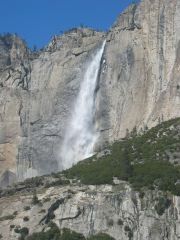 You can see how, over time, the water is carving a V shape in the cliff. 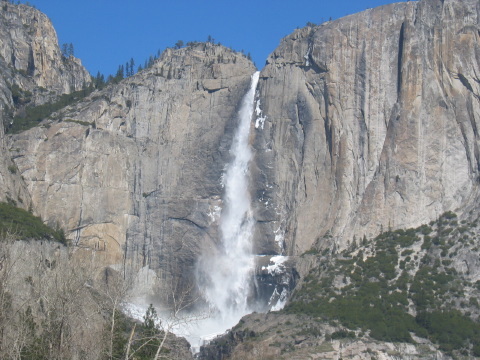 A closeup of the Upper Falls. 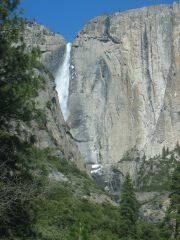 And an attempted closeup of the Lower Falls. 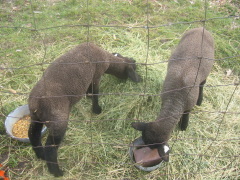 Meanwhile, back at the homestead, the lambs are chowing down!